GALION — Last season was a banner year for Northmor’s boys basketball team. The Knights finished their season at 19-6 overall and for the first time in school history, the Knights won a conference title. They did so with a Mid-Ohio Athletic Conference Blue Division record of 11-3 to split the title with the Cardington Pirates (18-7, 11-3). The boys squad also made it to the third round of the Division III tournament. After defeating Fredericktown, Northmor won a double-overtime thriller against Bishop Ready. In that third-round contest, the Golden Knights were bounced from the tourney by Columbus Academy. Zach Ruth will return as the leader of the boys squad for his ninth year. Two big pieces will be missing from last year’s group of guys but Ruth and the Knights will return many key components with hopes of repeat success. Top defensively player Zach Parrott and the Knights’ sixth-man, Alijah Keen, graduated, as did backup guard Nate Hall. However, Northmor will have three all-conference players sporting the black and gold in 2017-2018. Meechie Johnson, fresh off of a nearly 2,500 yard rushing season for the Knights’ football team, returns for his senior season after earning a first-team all-conference nod last year. Meechie led the MOAC in steals at 2.9 per game to go along with 11 ppg and 4 apg. Joining him will be the 6’6” twins in the middle, Tyler and Kyle Kegley. Tyler averaged a double-double a season ago at 10 ppg and 10.1 rpg (second in MOAC) as well as 2.5 blocks per game (also second) to earn second-team all-conference. Kyle scored nine points per game and was honorable mention District XI. Brock Pletcher, also a senior, was Northmor’s leading scorer at 12.5 ppg and was named a MOAC Blue honorable mention player in ‘16-‘17. Senior Lane Bachelder will be back in the mix after missing most of last season with a broken foot. He will be joined by 6’5” sophomore Blake Miller. Bachelder and Miller will likely compete for the fifth starting spot in the Knights’ rotation. Now a member of the Knox-Morrow Athletic Conference, the Knights will still face a familiar group of competitors. Northmor’s mission begins Friday, Dec. 1 when they open their campaign, at home, against the Pleasant Spartans. 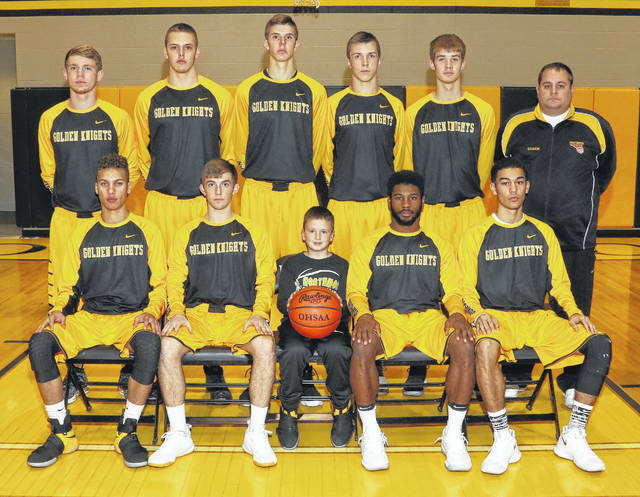 After a meeting with the Bucyrus Redmen, a big matchup to look forward to will occur on Wednesday, Dec. 6 when the Colonel Crawford Eagles travel to Northmor. KMAC play is set to open up on Friday, Dec. 8, when the Golden Knights play host to the traveling Fredericktown Freddies.